All treaties, from human rights to international trade, include formal exceptions that allow governments to legally break the rules that they have committed to, in order to deal with unexpected events. Such institutional 'flexibility' is necessary, yet it raises a tricky theoretical question: how to allow for this necessary flexibility, while preventing its abuse? 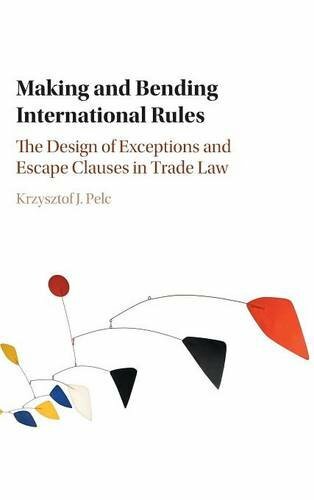 Krzysztof Pelc examines how designers of rules in vastly different settings come upon similar solutions to render treaties resistant to unexpected events. Essential for undergraduate students, graduate students, and scholars in political science, economics, and law, the book provides a comprehensive account of the politics of treaty flexibility. Drawing on a wide range of evidence, its multi-disciplinary approach addresses the paradoxes inherent in making and bending international rules. If you have any questions about this product by Krzysztof J Pelc, contact us by completing and submitting the form below. If you are looking for a specif part number, please include it with your message.